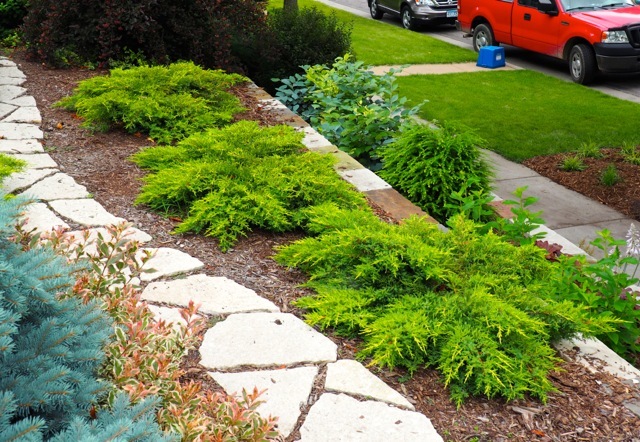 If you have need for a low-growing evergreen shrub that will fill a large, sunny space with terrific color and exceptional texture, consider this stellar variety of juniper. New spring growth emerges golden yellow, offering splendid contrast to blue-green mature growth. The new growth retains a yellow tint throughout the growing season. Plants grow in horizontal layers slowly reaching sixteen inches in height. Mature spread ranges from five to six feet. Plant in full sun in any decent soil. Plants adapt to a wide range of soil pH and will tolerate clay soils, if you must. Water moderately every three days after planting, adjusting to weekly watering after the first month. Once established, plants are fairly drought resistant and may need weekly watering only during dry periods in the peak heat of summer. Branches are easily pruned to maintain a jagged round or oval footprint, or may be pruned to create a low, long and narrow form. Pruning is best done in winter or very early spring. Wear gloves and long sleeves, as needles are somewhat prickly. 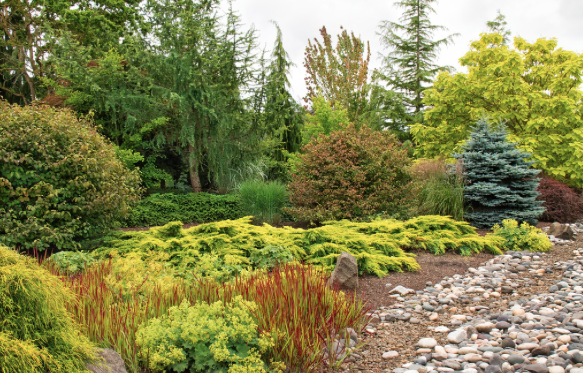 A single plant looks stellar, placed as a dazzling accent when surrounded by blue, reddish and green-leaved shrubs with upright and rounded form. Or plant in swaths to form a curving carpet of color and texture. Hardy to zone 4.